For cricket enthusiasts, the last week saw two glorious innings and sixes galore at the World Cup from Chris Gayle and A B De Villiers. Indophiles were seeking the same from the first real budget of the Modi Jaitley duo – some big sixes out of the stadium or big bang reforms as it was more popularly known in the run up to the Budget. So did Budget 2015 deliver on those expectations? We thought there were a few sixes, but mostly a combination of singles, twos and boundaries, essentially an innings that is being built for the long term so that India is well prepared to hit many more sixes when it really matters. Inflation targeting agreement with RBI – Inflation and inflationary expectations have been a huge challenge for India, and we will now have both the Central Bank and the government willing to work together through a Monetary Policy committee to have coordinated action on the inflation front. Inflation is the single largest variable that influences your personal financial plan, so stability around inflation should be your biggest benefit as an investor. Roll out of the Goods and Services Tax (GST) by April 2016 – We finally have a clear date to look forward to, for a tax regime that is potentially much easier. Remember though, that GST will take a couple of years to settle down, and is not likely to change things overnight. Scrapping of the Direct Tax Code (DTC) – Stability of a tax regime is most critical and the DTC was trying to change too many things at once. It got a quiet burial in this budget. Focus on ease of doing business – Whether you run your own businesses or are salaried, the need to get rid of red tape and make it simpler and easier to move forward, will be of huge help. Plug and Play could be significant. Collaborative Centre State Relationships – The Big Daddy approach of the Central government, getting replaced by a collaborative approach and greater flexibility for states to spend their monies in areas where they think it is most relevant, is refreshing. After all, don’t we all think that it is critical to know what’s happening on the ground to finally decide. Focus on financial assets – With most Indian households having a significant portion of their wealth in physical assets like real estate and gold, there has been a significant effort to get savings towards financial assets. This focus is evident through the fact that even where the underlying asset could still be physical, products like Real Estate Investment Trusts ( REITs) and sovereign gold bonds get a fillip. Additional 2% surcharge on annual taxable income – In case you earn more than Rs. 1 crore, you will need to pay a higher tax due to this enhanced surcharge. Transport allowance exemption doubled to Rs 19200 per annum – Most people will benefit, and expect your employer to restructure your salary so that this benefit is available for you. 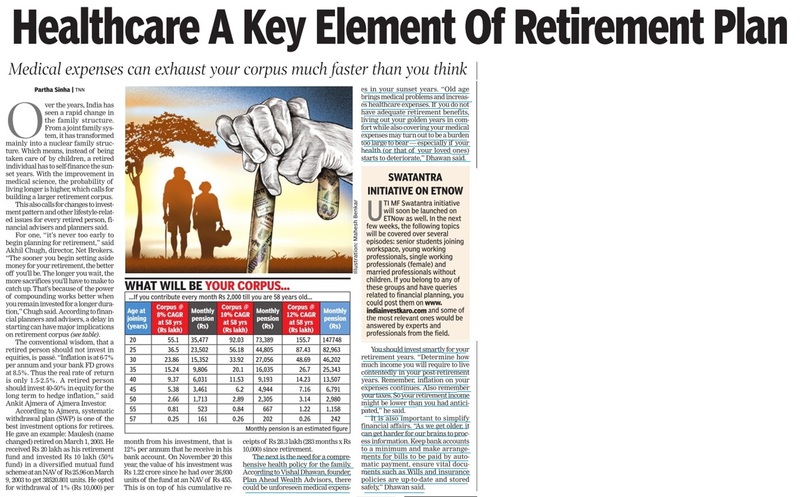 Additional tax saving of Rs 50000 per annum by investing in the New Pension Scheme (NPS) – Whilst the tax break is important, weigh this tax benefit vis a vis the fact that the returns from the NPS are taxable, and necessarily need to be annuitized to a significant extent. Ensure that your choice of a retirement product is not driven by the tax benefit alone. Higher deductions on health insurance – Limits raised to Rs. 25000 per annum for those below 60 and Rs. 30000 per annum for those above 60. In case of those over 80, even though they may not be covered by health insurance, medical expenses of upto Rs. 30000 will be permitted as a deduction. Increase in service tax – You will need to pay higher service tax for the services that you consume, as service tax has been raised to 14%. In addition, there is an enabling provision to charge 2% additionally as a cess, which may or may not be used. If introduced, service tax could then move to 16%. Better targeted subsidies – In the past, we may have all benefited due to the fact that subsidies were provided across the board. With significant focused on direct benefit transfers, expect these subsidies to be available only to those who truly need it. The JAM trinity (Jan Dhan, Aadhaar and Mobile numbers) could have this working quicker than anticipated. PAN mandatory for all expenses above Rs. 1 lakh – Whilst this will help in curbing unaccounted money, let’s hope that the process does not increase notices to people who are paying all their taxes anyways. Scrapping of wealth tax – making it easier for you to decide on which asset class to invest in rather than worrying about tax arbitrage on one asset class over another. Asset allocation continues to hold the key – Whilst Union Budgets can tactically create some short term opportunities, this budget was devoid of any such big opportunities, and is a more workman like budget , getting you to focus on how your investments are structured to benefit from the long term story of India. Your overseas holdings need to be fully reported and taxes paid – If you have ever worked overseas or have any monies, bank accounts, assets held overseas and have been too busy to declare them, please ensure you do so now as the penalties are very significant from now on. Capital gains tax benefits remain as is – India has one of the most advantageous tax regimes for long term capital gains taxes in equity markets through stocks and mutual funds. There has been no change in this regard. Corporate tax reduction from 30% to 25% over four years – With the effective tax rate in India being approximately 23% currently, this is unlikely to be a significant change. In fact, for FY 15-16, corporate taxes will go up marginally. 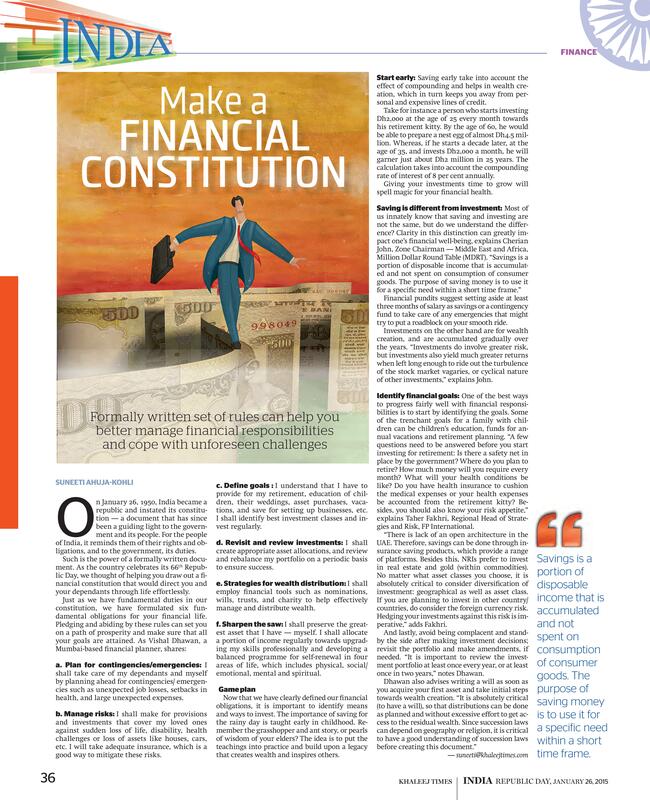 Multiple answers for foreign investors – Many unanswered questions for foreigners have been answered – no retrospective taxation, GAAR being deferred, a composite cap for foreign investments instead of FPI and FDI limits separately, amongst others. Infrastructure gets a big boost – The multiplier that infrastructure growth can create, can be significant if the challenges of the past can be addressed. Initiatives like plug and play, greater focus on roads and power, and some innovative financing tools like the National Investment and Infrastructure Fund, could move GDP up significantly, which could see India remain a favorite investment destination for foreigners to invest in through equity markets. High strategic disinvestment target – Whilst the companies that will be divested is unclear, there is an expectation that privatization could come back as details of this become clearer, ensuring the government stays in businesses only where it absolutely needs to. As earnings continue to be sluggish, look to build your exposure to equities gradually over the six months to 1 year through systematic investment strategies, so that you can take advantage of volatility driven by news from overseas and domestic issues. Fiscal deficit at 3.9% of GDP– With the government sticking to its medium term target of 3% but moving it by a year, it seemed like a tight balancing act, trying to keep the foreigners and rating agencies controlled on one side, and people screaming for growth through higher spending quiet on the other. Net Market borrowing at Rs 4.56 lakh crores – There was a wide range of expectations on this number, and the fact that it has gone up only marginally vis a vis last year, will mean that supply of government paper will be controlled, thereby helping in controlling interest rates. TDS on recurring deposits and cooperative banks introduced – As a part of the widening of the tax net, recurring deposits will also be subject to TDS from June 2015 and deposits with cooperative banks will also be subject to TDS. Dividend distribution tax on debt funds hiked marginally – increased from 28.325% to 28.84 % is unlikely to have any significant impact. Tax free bonds make a comeback – With the focus on infrastructure, the government has announced issuance of tax free bonds, which should enable investors seeking to lock into interest rates for a longer duration, an option to do so. Whilst the timing of the next interest rate cut is going to be challenging to guess, the expectation of lower interest rates in the economy over the next 12 -24 months should continue. 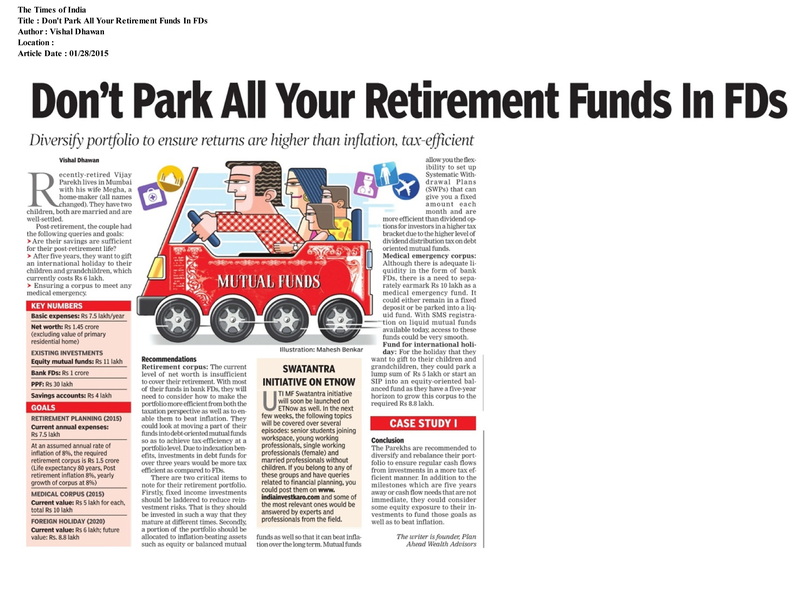 Thus, having between one third to half of your portfolio to take advantage of falling interest rates through government securities, income funds and dynamic bond funds would be a suggested approach. Introduction of sovereign gold bonds – Whilst gold ETFs and gold mutual funds already exist giving you access to the change in prices of gold without holding it physically, gold bonds are expected to also pay a fixed return, making gold a potential income generating instrument from only being dependent on capital gains for investors to generate returns. Details are awaited. Demonetisation of physical gold – With a significant amount of gold in India lying in cupboards and lockers, the gold monetization scheme that was announced is expected to get investors to deposit their gold and earn a rate of return on it. Similar schemes have not worked in the past, so we will have to see how it is structured to make it succeed this time. Real Estate Investment Trusts ( REITs) and Infrastructure Investment Trust (InviTs) get tax clarity – Whilst these are very popular overseas, the lack of tax clarity prevented them from taking off. With the pass through status of these vehicles getting clarity, expect these to be launched this year, and a potential new addition to your portfolio. Black money reduction – Multiple steps like making it mandatory for all payments and receipts for real estate transactions above Rs. 20000 to be in cheque and a benami transaction prohibition bill should result in reduction of black money reduction in real estate. So whilst India continues on its journey to retain its World Cup Cricket title, let’s hope the implementation of this budget makes India retain its most favoured investment destination status in the years ahead. Want to get the most from this budget? 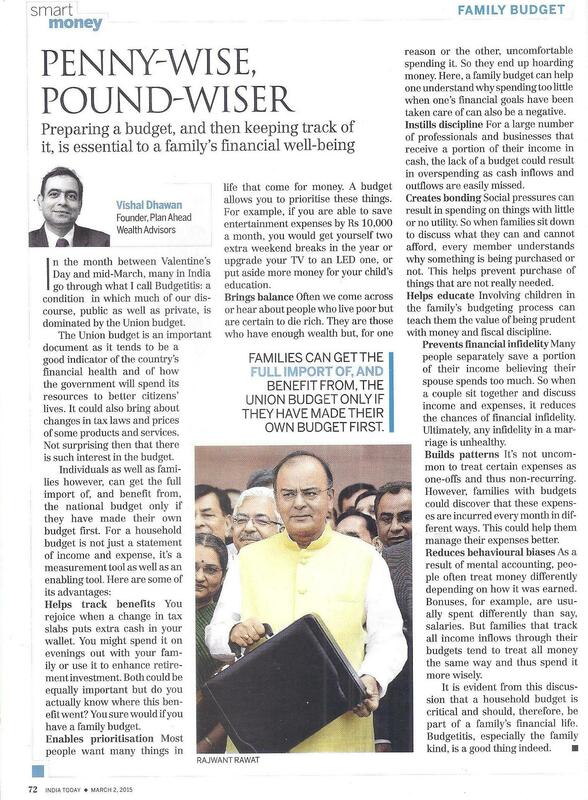 Individuals and families can get the most benefit from the union budget only if they have made their own budget first – says Vishal Dhawan in India Today. 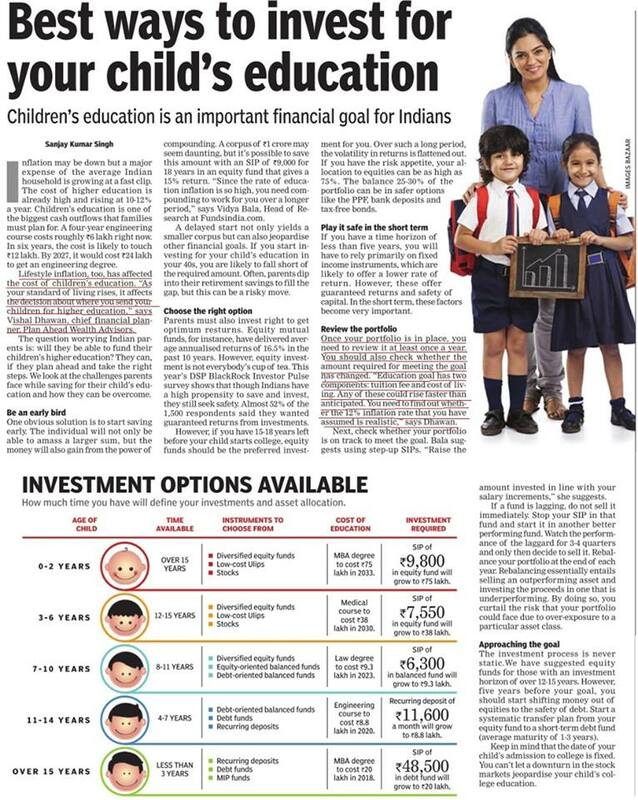 Read on to know why it is critical to prepare a household budget. Financial Vows Every Newlywed should take..